The arrangement of vegetable fields into a bed layout with permanent growing areas and separate wheeltracks (alleys) has several advantages. In contrast to systems in which beds are re-formed every year, compaction from tractor tires is confined to the non-cropped area. Beds can be managed individually by crop which simplifies planning. The beds may also be raised compared to the alleys if necessary, allowing them to dry out earlier for timely planting in spring. These advantages can be augmented by leaving the alleys in permanent grass sod. Such grass strips between the beds allow workers to be in a clean area without mud, provide beneficial insect habitat, help dry the growing beds out earlier by transpiring water, reduce the tilled area, and build soil carbon. However, the grass strips need to be managed to prevent too much growth and consequent competition with the cash crops and the buildup of perennial weeds. These negative aspects have thwarted many organic vegetable farmers who have attempted to implement permanent beds with grass strips. Blue Heron Farm in Lodi, NY is one of the few who succeed with this approach. How do they do it? First, some background. Lou Johns and Robin Ostfeld started Blue Heron Farm near Olympia, WA in 1981. They bought a semi-abandoned 150 acre farm, mostly wooded, and moved to Lodi, NY in 1986. They started over in their New York location where the soil was fairly productive but had drainage issues. The heavy traffic of vegetable production took its toll over the first several seasons. Compaction was an issue due to high clay content soils and shallow topsoil layer and likely to get worse. Lou and Robin had been thinking about a system of permanent beds with grass alleys, and perhaps this was a good opportunity to try it out. They had read and studied about the soil, and knew that good soil stewardship was key to productivity on their certified organic farm. Experts and other farmers, however, were not optimistic about the grass strip approach. By 1995 Lou and Robin were ready to embark on a radical idea. At this point they were growing about 12 acres of cash and cover crops. They laid out one of the three main crop fields in a pattern of 70” wide beds separated by strips just wide enough for the tractor tires. The “grass” strips were simply left to grow whatever grasses and weeds emerged. Beds were flat, not raised, because managing the sides of raised beds was problematical. They had their tractor axles extended to straddle such wide beds, which equaled the width tilled by their rototiller. And thus the 5-year process of converting the whole farm began. Results were good enough to continue, though it took 10 years before their soils reached their full potential. In those first years of permanent beds, they encountered difficulty keeping the bed edges even with the sod strips. Uneven edges and stones thrown into the strips made mowing difficult, and ruined many lawnmowers. They welded plates onto their tiller to keep stones and soil in, and added spider gangs from Lilliston cultivator units to smooth the soil gently back toward the bed during tillage. (The spider gangs have since been removed and additional shielding has been added to the end plates of the tiller. These now contain all the soil and stones worked by the tiller in the bed.) 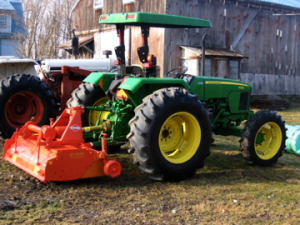 Similar modifications were made to cultivators to maintain the bed edges. Also over the years, they widened the sod strips substantially. This allowed use of a riding mower on the widest ones, which was most useful in spring when the grass grew rapidly. By 2010, roughly 1/3 of each field was taken up by the grass strips. Lou and Robin felt that the benefits of the strips and the high productivity of the beds more than justified that apparent “loss” of growing area. The permanent beds were easy to track for crop rotation purposes, which was important given the high diversity of crops that Blue Heron Farm grew, often with multiple planting dates. It is hard to know which aspects are fundamental for the success of this integrated system. Certainly, the equipment modifications enabling management of bed edges and weeds were critical. The farm uses overhead irrigation, so sod strips receive water as well as the crop beds—thus sod roots are not robbing moisture from the beds. Compost applications to the beds are fairly high. Nothing is applied to the strips, but the sod’s roots probably scavenge nutrients from the beds. It is possible that the wide 70” beds are optimal to prevent sod roots from competing much with cash crops. When the strips are mown, clippings are usually blown into the beds, capturing nutrients and organic matter in the beds. Wood chips are present in the compost applied to the beds, which has likely improved water-holding capacity over time. Cover crops are used heavily, and beds are put into a grass/legume fallow every 10 years or so. All of these aspects may contribute to good results from this system. The downsides of this system are the time required to mow the grass strips, and also the high level of skill needed to till and prepare the beds. Lou does all of the prep work. Over the years they upgraded to 4 wheel drive tractors which track straighter than 2 wheel. They maintain multiple mowers, and in May, it is often hard to keep up with the mowing. It is also possible that during very dry weather, the sod strips may reduce overall moisture in the fields, increasing the need for irrigation. These negative management factors are counterbalanced by the ease of working in the fields—plenty of room for workers, a clean area to put boxes and bunches of produce ready for packing, and no slogging through mud to move irrigation pipe. In very wet periods, nearby sod roots may actually help beds dry out more quickly. However, the overriding factor may be persistence. Lou says, “Recognize the benefit of being persistent and focused on your goals. Don’t give up too soon, but do stop and look at what you are doing and decide if it is worth it to continue on this path. Give yourself enough time to carry out your goals. Good results take time.” Lou and Robin were convinced that their approach would yield rewards after they worked out the kinks. A similar mentality governs crop practices on their farm. Cover crops are used extensively and with the sod strips, the soil is covered by green growing plants for almost all of the year. Two practices set them apart. 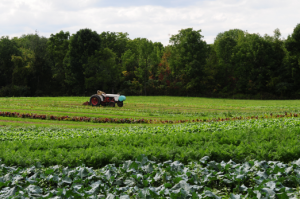 Blue Heron Farm grows many July-planted storage crops including carrots and brassicas. These usually follow overwintered cover crops. Often the problem in this situation is that the cover crops reach maturity and threaten to set seed before the cash crops are ready to be planted. Lou and Robin devised a novel practice of mowing to solve this problem and get the most growth out of their cover crops. 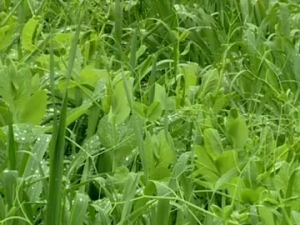 Cover crops (often a mix of wheat, vetch, and Austrian winter peas) are allowed to get 3’ tall, typically in late May, then flail mowed at a height of 1’. The regrowth is dominated by legumes and is again mowed about a foot high. The second regrowth is again dominated by the legumes. When it gets to a foot or so, it is mowed close to the soil level. All of the residue is then tilled in roughly. After a week or so, it is tilled again for July transplants. Timing can be altered a bit to allow for the extra tillage needed to produce a fine seedbed for root crops. Using this approach, cover crops are growing, covering the soil, fixing nitrogen and adding organic matter until shortly before planting. Bare fallow periods are eliminated. Another remarkable practice is how Blue Heron Farm manages asparagus. For many organic asparagus growers, weeds are a constant struggle. Blue Heron overcomes this problem, again with cover crops. In early spring before emergence if weather allows, the asparagus beds are tilled lightly to a depth of about 3”. This does not harm the crop. Harvest proceeds normally. After the harvest is over, beds are again tilled shallowly, killing weeds but again not harming the asparagus crowns. The next day, a cover crop mix of soybeans, hairy vetch, field peas, and buckwheat is drilled to fill the beds. This mix, with asparagus ferns growing above, is left for the rest of the season. When the asparagus ferns yellow, the entire mass is flail mowed. It is roughly tilled in if time allows. Similar to their novel cover crop mowing regime, this process controls weeds, grows biomass, adds some fixed legume nitrogen, and protects the soil over winter. Lou and Robin created a productive and profitable vegetable production system for Blue Heron Farm. They put together the pieces within a vision of improving soil health and managing their challenging soil moisture regime. Part of this was reducing tillage only to crop bed areas while maintaining soil-enhancing sod strips throughout their fields. Field traffic never compacts the beds. Beneficial insects live in the strips right next to the crops. They manage cover crops intensively and a high percentage of their land is covered in winter. All these practices result in a beautiful, viable, and sustainable farm.